I have a beautiful set of brushes that are, in themselves, very inspiring to me. The long handles and precise hair bristles allow me to create, to project what I am feeling in color and texture. Every now and then, though, a different color than what I intended to comes through. That bit of color I didn't completely wash off changes what I intended to create. Such is life. 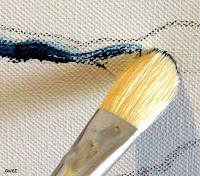 Sometimes we begin a new stage in our lives with old color in our fibers. We bring our insecurities, our fears, our suspicions, our unsatisfied needs, our anger, our immaturity, our selfishness, our assumptions, and our unresolved issues into new relationships, new jobs and new ventures. It is very difficult to separate what our past experiences have shaped in us from the contamination leftover. Yet it is necessary that we become aware of what are old thoughts and behaviors bleeding through to our new experience in order not to pollute it. Our new life events are primed for new color, textures and flavors. Our creations reflect that which we have within. Today is a good day to let go of everything that is tainting your days, your relationships, your health, your existence, your creativity. Come clean. Enjoy the freshness of a genesis uncorrupted by the past. Enjoy life the way you would color it.